We recently went to a dressage show in Aiken to watch our granddaughter compete in her first recognized show, and while we were there we had the opportunity to watch our first Grand Prix. We marveled at the fancy trot the horses performed. It looked great to us, but we wondered what it was, and if the judge was as impressed as we were. I’m glad you were able to come out to our local USEF dressage show and that you enjoyed the Grand Prix. The Grand Prix is the highest level in dressage, and is the level that you see at the Olympics. The fancy trots you are referring to are called the passage and piaffe. These are impressive movements. Not all horses have the ability to perform them, because they take great strength, coordination and balance. This is why they are only asked for at the highest and hardest levels of dressage. Let’s look at the passage first. If you saw the horse performing what appeared to be a slow motion trot around the arena, this is called a passage. The passage is a very collected, highly elevated, cadenced trot, with prolonged periods of suspension. A good passage should have the hindquarters well engaged and active. The height of the toe of the raised foreleg should be level with the middle of the cannon bone of the other foreleg. The aim of passage is to demonstrate the highest degree of collection, cadence and suspension in the trot. 1. Rider sitting in harmony with the horse. The rider should hardly be moving at all. 2. Clear moments of suspension with prolonged engagement of hindquarter. The horse should appear to have significant “air time” with all four legs. 3. The horse is steady on the bit. The neck should be raised and the poll (the top of the horse’s head, between his ears) should be the highest point. 4. Regularity of each lifting leg. Each leg should perform equally and evenly. 5. Impression of controlled power. 6. Expressive, confident and effortless. If you saw what appeared to be a horse trotting in place, this movement is called the piaffe. 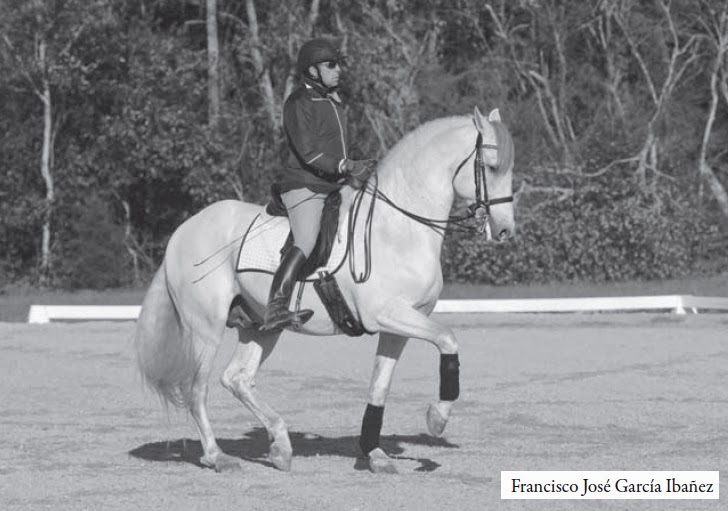 The piaffe is a highly collected, cadenced, elevated trot on the spot. In a good piaffe, the horse should not move forward or backward, although at some levels horses are allowed to move forward slightly. Each diagonal pair of feet is raised and returned to the ground alternately, with an even cadence. The height of the toe of the raised foreleg should be level with the middle of the cannon bone of the other foreleg. The toe of the raised hind leg should reach just above the fetlock joint of the other hind leg. The aim of the piaffe is to demonstrate the highest degree of collection, while giving the impression of remaining in place. 1. The rider is sitting quietly and in harmony. 2. The horse is willing and lively with forward intent, without moving forward significantly, performing the required number of steps. 3. The horse remains steady on the bit, with consistent elastic contact. The neck should be raised and the poll should be the highest point. 4. The haunches should be lowered, and each step should have elasticity and spring. 5. The movement should demonstrate cadence and regularity. Other aspects judges look at are the transitions from passage to piaffe and from piaffe to passage. This is the ultimate demonstration of submission and self-carriage, and shows the well-trained dressage horse at his most spectacular. When executed well, it is pure beauty, a thrill to behold, and a joy to judge. At the Aiken shows, we are lucky to have horses performing at the Grand Prix level, so spectators can enjoy and experience the pinnacle of dressage. “You never know what is going to happen in the horse business,” says Lellie Ward, who owns and runs Paradise Farm in Aiken. Paradise Farm is a 109-acre training and eventing facility on the east side of town. Lellie herself has an impressive background in all aspects of horsemanship, but especially in eventing. A serious competitor for over 40 years, she was at the top of the game for more than 20, competing in the Rolex Kentucky Three Day Event four times on three different horses. She was also a serious contender for the U.S. Olympic team four times, trained ten horses from their first events to the Advanced level, and sold horses on to some of the best riders in the world. In addition, she is an insightful and experienced instructor who holds a USEA Level III teaching certificate as well as certificates from Germany and Great Britain. Her recognized and schooling events in Aiken are known for being well-run, well-organized and well-attended. But all of that changed in a split second in early 2012. Lellie landed straight down on her face, breaking three vertebrae in her neck and sustaining spinal cord damage. She also cut her face so badly she needed 76 stitches to repair it. Lellie had been planning to give a lesson after her ride, and when the horse she had been riding galloped back to the barn, her students came out and found her. They called 911, and an ambulance came and took her directly to the trauma unit in Augusta. But Lellie says that her first reaction was not to be frightened. A plastic surgeon repaired Lellie’s face, and did such a good job that today she does not have any obvious scars. For her neck fracture, she was provided with a neck brace, which she wore for several months. The damage to her spinal cord initially caused her arms to curl up against her body. She had limited ability to use them, and parasthesia (nerve pain) that was excruciating. Gradually, she got better. Her neck healed, and strength and mobility returned to her arms. The parasthesia diminished, and now she only feels the numbness and tingling in a couple of fingers on each hand. At her last doctor’s appointment, four months after the accident, they told her that she was going to be fine, and they released her. By the end of the summer of 2012, Lellie’s face had healed, her neck brace was off and she could use her arms again. She even sat on a few horses. But it would take much longer for her to heal mentally, and even longer for her business to return to health. At the time of her injury, Lellie had about 16 horses in training, some of her own and the majority for other people. After the injury, the horses she had in training were gone, leaving her with a handful of her own personal horses. For a while, she was hiring people to come and ride them, but found that frustrating and not sustainable in the long run. Lellie, who describes herself as an “all-or-nothing” type of person, knew she would have to make some decisions. She realized that selling the farm was not really a viable option, considering the weakness in the real estate market. So she decided to shift her focus. Instead of basing her business on training horses, she would hold more events and competitions. She knew she wanted to ride again, but now, instead of focusing on advancing through the levels in eventing, she would dedicate herself to learning, riding for her own knowledge and enjoyment. She had already started taking showjumping lessons with Daniel Geitner, who she says helped her immensely through her recovery and was instrumental in restoring her confidence. Then she called Shawna Harding and began studying dressage seriously. “After my first 15 minutes of riding with Shawna, I was exhausted,” she says. “I almost had to pull up and say, ‘I don’t know if I can do this.’ It was so fascinating. The lessons with her were such hard work, but that’s where I thrive. Returning to Paradise Farm reinvigorated, she started running monthly shows during the winter during Aiken’s high season for eventing. The shows were hugely successful. Today, Lellie is teaching again, and says she would love to have more students. She is also organizing horse trials, hunter trials and combined tests. Paradise Farm offers competitions for all levels, as well as unlimited opportunities for trainers to come school their own horses or give lessons to their students at a horse show quality facility. There are several recognized shows each year, and a growing list of schooling shows. The farm itself is constantly being improved. This spring, Lellie is breaking ground on two large new arenas. She is also building a hunter-style bank. In the future, she even hopes to add Intermediate and Advanced level fences to her cross country course. “I’m reorganizing my life,” says Lellie, who admits that she now spends more time in the office than on a horse. “I had such a wonderful response from Aiken in terms of sponsorship this year, and I am so grateful to all the riders for coming back to the farm. It really meant a lot to me, and gave me the desire to keep doing it. I’ve been to the bottom. Now I want to go back to the top. I don’t spend my days thinking why? I spend my days thinking how?